- During the drug manufacturing process, milling is often required in order to reduce the average particle size in a drug powder. Throughput: 3 Ton per Hr max. Middle Deck: 3 mm perforated plate with 3 mm holes. Top Deck: 6 mm perforated plate with I0 mm holes. - Reduces pieces or lumps from 200mm to 3mm sizes. - Heavy and sturdy rotor design. M/s Bharti Heavy Engineering Co.
- Delumpers are recommended to crush materials containing small percentage of lumps or agglomerates into uniform coarser material. 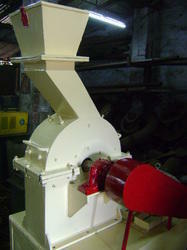 The Lump Breaker is designed for breaking up friable lumps & agglomerates that have formed in dry powders and granules. Ambica’s Lump Breaker is designed to provide a simple, more economical means of reducing compacted materials into smaller, granulated product required for most processing or packaging lines. The Lump Breaker improves product flow for a variety of applications including: sugar, salt, chemicals, cereal, kiln dust, resin, pigment, filter cake, pasta, fertilizer and more. - Dryer: To reduce the size of the lumps that keeps high humidity content. - Granulation process: To reduce deliberately compact material in order to obtain a homogeneous drying. - Pneumatic transfer: To reduce natural agglomerations that may block the flow. Link Breaker Machines are designed to break the links in the metal strips used in the rubber strip/profile formation to enable the profile to bend into desired shapes.